Theoretically we should be in North San Diego area when this posts. Fingers crossed? ROFL… He was well Pflarb’d! In space, fooms are always silent. Pooms, on the other hand, are audible to grasshoppers, if they happen to be near. In reality, the “poom” is coming from the phone. Flyp gleefully went “Poom!” when he pushed the detonator. 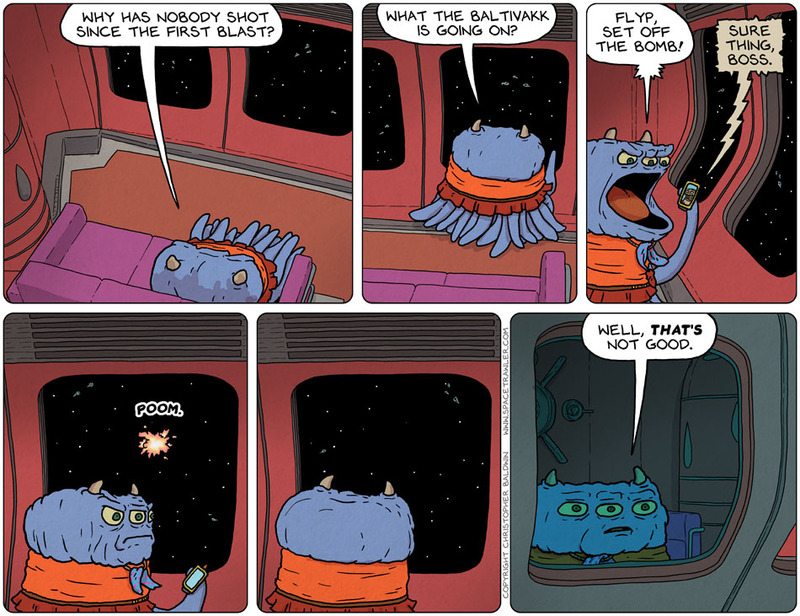 Well, aside from the pedantic satisfaction of pointing out that yes, in space nobody can hear you “poom” I do think it would’ve worked better as a purely visual gag without the sound effect. You’ve already got Hypock setting up the expectation of -something- happening outside the window and then her reaction shot, more than enough for the audience to empathize with the whole wet firecracker situation. Even her last line could be truncated to a defeated, soft-voiced four-letter expletive. It’s spelled with the silent letters from “fifth”, “leopard”, and “mnemonic”. Oops, I thought that was a silent F. Make it “psycho”. I love it when a plan comes apart exactly as predicted. Too bad it won’t last. Actually the compute creates such sounds so that beings who see such things can hear a satisfying sound effect. Makes it seem right. Why it was decided early on Star Trek to include sound for the viewers. Otherwise it sound lacking and dead. Yes a “poom” not a “foom” as I miswrote. Different capacity and technology. The computer’s data base has a Foley file on it gotten off of many battles on planets to be able to use it correctly. Many ships A.I.s have them. Though the explosion didn’t seem so great. We know why, it wasn’t blowing up a battle cruiser where its armaments and fuel along with its power core juices up that “poom”! Just itself. In Jasper T. Scott’s “Dark Space” series the ships are equipped with SISS or Sound In Space Simulator technology. Sensors detect the positions of other ships relative to each other then play appropriate noises in surround sound inside the cockpit and/or pilot helmet as appropriate. That way fighter pilots get audible cues to the location of enemy fighters so they don’t have to constantly be looking at the displays. It’s also the only book series I’ve read that has a planet with room for trillions of inhabitants AND the trillions of inhabitants. So many others have multi-level city covered planets or massive space stations but the author failed to do the math and depicts far too small a population to reach the depicted Tokyo subway at rush hour density. One example is Randolph Lalande’s “Spinward Fringe” series that starts on a station with a walkable surface area “half that of old Earth” yet the protagonist lives in a literally closet sized apartment. It’s never precisely stated how many inhabitants but either the majority of the station’s space is being used for non-living area or there’s 7+ billion inhabitants in order to not provide every person 1,000 square feet of deck space. Yesss! I asked yesterday if we would see the bomb explode and POOM! We not only saw it but heard it! Yay! My sci-fi head cannon for this sort of thing is that the sound effects that we always hear in space stories are actually simulated by a computer. A “user experience” thing. To make life in space feel more natural, and to allow people to make use of their rapid audio information gathering, simulated “sounds” from things out in the vacuum are played inside space ships and space stations. It’s like the sound and feel that iPhones make when you press certain “buttons”. The “click” sound plays from a speaker and the vibration is done with the buzzer because there’s nothing to actually click or move — it’s just more touch recognition — but it makes those of us used to buttons that clicks more satisfied and not confused by “button” that doesn’t respond audibly when we activate it. You can turn it off in the settings menu, though.